The Turopolje pig is without doubt the oldest in Croatia and can therefore be considered one of the oldest in Europe. It came into being in the Turopolje region which is situated between the Kupa and Sava rivers east of Zagreb. Pig rearing in the Turopolje region certainly goes back to the pre-historical period and is a factor in the process of domestication. It has been shown that the Ljubljana wild boar lived along the higher reaches of the Sava river and that the inhabitants of these regions domesticated it. 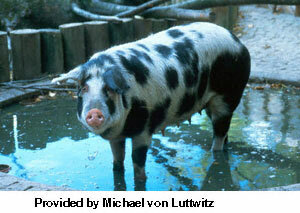 The domesticated animal was the "peatland pig" reared by the inhabitants of the upper reaches of the Sava river who lived in houses on stilts. From this domestic breed was developed the ideal production form, the Krskopoljski pig. During the pre-historical period and antiquity the Krskopoljski pig spread to the Turopolje region. We know that the Croats reared pigs in their original homeland (beyond the Carpathian mountains) and that they brought them with them when they arrived in their new homeland. This breed is believed to be the Siska breed which subsequently spread throughout the entire Balkan peninsula. It is also believed that the Turopolje pig resulted from crossing the Siska breed with the Krskopoljski from neighboring Slovenia. The Turopolje pig adapted itself perfectly to the ecosystem, using the extensive oak woodlands as an important source of food. The first documentary evidence of the Turopolje breed is the decree of the Croatian-Hungarian king Ljudevit sent to Zagreb in 1352 demanding an investigation into the plunder of pigs which Gregory, an official of the local ruler, had committed in the woodlands of Turopolje. The Turopolje breed developed over a long period. Its destiny was closely bound to the situation in Turopolje. During the course of history the breed has been subject to a series of transformations, some of which are known to us. In the more settled situation that came about at the end of the seventeenth century due to the cessation of the Turkish threat, an economic upsurge took place. The existing form of the Turopolje pig no longer satisfied economic requirements. During this period the Turopoljans obtained white-haired pigs from southern Austria and Zagorje (a Croatian region north of Zagreb) and crossed them with the existing breed. The resulting breed however did not last long due to the cracking of the skin in the summer months which caused considerable losses and the stagnation of pig husbandry in the second half of the eighteenth and the first half of the nineteenth century. The turning point came when Misko von Leder from Kurilovac "brought from somewhere some kind of pigs" which he crossed with his own local pigs. The result was a high quality pig with stable production characteristics which met the demands of the economy. News of Leder's quality pigs traveled through the regions between the Sava and Kupa rivers and the breed spread quickly. It spread in two directions; to the east and the west. To the west it spread beyond Zagreb to Jastrebarsko and Draganica. Towards the east it spread through Turopoljski Lug beyond Sisak to Lonjsko Polje taking in the Vukomericke hills and it moved south-east along the kupa river beyond Sisak also reaching Lonjsko Polje. The woodland regions proved to be especially suitable for rearing this breed. In the second half of the nineteenth and first half of the twentieth century the modern Turopolje pig (Leder's pig) was developed. It became an important element in the economy, well known in the markets of Austria and Hungary. During this period the breed spread outside the Turopolje region into Slavonija, Podravina and south-west Hungary. A specific diet contributed to the success of this breed which was fed mainly in woodlands on acorns and, just prior to slaughter, on maize (corn). The pigs found protein by eating the worms and larvae they found in the woods. The pigs were slaughtered either at home or in the woods. A successful year depended on the abundance of acorns and water. In such a year the pigs were ready for slaughter when they came from the woods and only a small amount of maize was needed. 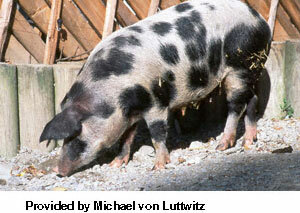 Sows from 2-4 years old were slaughtered along with castrated males more than one year old. When the pigs came from the woods they were fed one kilo of maize per day with plenty of clean water in order to clean the digestive tract for slaughter. After a few days the maize was gradually increased to five kilos per day. The fattened pigs would weigh from 170-220 kilos. off-white curly hair of average length; black patches on either side of the body; skin without pigment; long body; head of average length with concave profile; fertility: five piglets per brood; partially protruding ears of average length not covering the eyes; straight back; standard stomach; well developed udders with 10-12 teats; high level of resistance to disease; high level of adaptability to marshland; well able to withstand changes in climate and bad weather. The Turopolje pig has been eclipsed by the advance of white pigs which are better adapted to market requirements. During the last fifty years its numbers have been drastically reduced almost to the point of extinction. On the basis of the above it is clear that the Turopolje pig has a biological value important for civilization. This then is the last opportunity to save this valuable breed. With this in view the Noble Municipality of Turopolje has organized a genetic collection of these pigs in its autochthonous environment, Turopoljski Lug, with the aim of preserving and multiplying this breed.